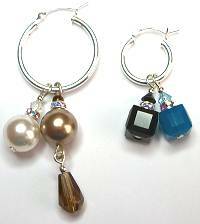 Charms that slip on and off hoop earrings, let you change your colors quickly, a great travel and gift idea! Charms are sold in pairs, hoop earrings also sold in pairs separately. You only need one pair of hoops, then pick more than one charm for your "wardrobe". Our selection features Swarovski brand crystals, lead free and made in Austria with the sharpest and most sparkling cuts available. Components made around the world, but assembled in Nevada. Charms are suspended on sterling silver wire, though you will find some styles that offer gold accents to work into your gold hoops too! 1-1/2 inch long, sterling silver wire with loop at top, designed to hang from hoop earring, slip on and off to change your wardrobe! Features 10mm Swarovski crystal pearl in winter white color, topped by 4mm rondelle with AB crystals around it, a 10mm clear crystal bead dangling below. 3/4 inch long, sterling silver wire with loop at top, designed to hang from hoop earring, slip on and off to change your wardrobe! Features 8mm Swarovski crystal in color jet black, with smaller 4mm crystal bicone accent and rondelle with AB crystals around it. Colorful simple charms featuring Swarovski crystals, hang them from hoop earrings, either the sterling silver ones we offer, or your own. Wear more than one charm to customize your look! Buy & Share Quantity Savings applies to the purchase of more than one pair of charms, mix colors and styles and save! Does not apply to sterling hoops, however. 3/4 inch long, sterling silver wire with loop at top, designed to hang from hoop earring, slip on and off to change your wardrobe! Features 8mm Swarovski crystal in color opaque deep Caribbean turquoise, with smaller 4mm crystal bicone accent and rondelle with AB crystals around it. 3/4 inch long, sterling silver wire with loop at top, designed to hang from hoop earring, slip on and off to change your wardrobe! Features 8mm Swarovski crystal in color transparent dark denim blue, with smaller 4mm crystal bicone accent and rondelle with AB crystals around it. 3/4 inch long, sterling silver wire with loop at top, designed to hang from hoop earring, slip on and off to change your wardrobe! Features 8mm Swarovski crystal in color transparent bright sapphire blue, with smaller 4mm crystal bicone accent and rondelle with AB crystals around it. 3/4 inch long, sterling silver wire with loop at top, designed to hang from hoop earring, slip on and off to change your wardrobe! Features 8mm Swarovski crystal in color transparent tanzanite purple, with smaller 4mm crystal bicone accent and rondelle with AB crystals around it. 3/4 inch long, sterling silver wire with loop at top, designed to hang from hoop earring, slip on and off to change your wardrobe! Features 8mm Swarovski crystal in transparent tanzanite purple, with smaller 4mm aurum gold crystal bicone accent and rondelle with AB crystals around it. The touch of gold makes this ideal to hang from your own gold hoops too! 7/8 inch long, sterling silver wire with loop at top, designed to hang from hoop earring, slip on and off to change your wardrobe! Features 10mm Swarovski crystal pearl in winter white color, with smaller 4mm clear crystal bicone accent and rondelle with AB crystals around it. 3/4 inch long, sterling silver wire with loop at top, designed to hang from hoop earring, slip on and off to change your wardrobe! Features 8mm Swarovski crystal in color jet black, with smaller 4mm aurum gold crystal bicone accent and rondelle with AB crystals around it. The touch of gold makes this ideal to hang from your own gold hoops too! 3/4 inch long, sterling silver wire with loop at top, designed to hang from hoop earring, slip on and off to change your wardrobe! Features 8mm Swarovski crystal in color opaque Caribbean turquoise, with smaller 4mm aurum gold crystal bicone accent and rondelle with AB crystals around it. The touch of gold makes this ideal to hang from your own gold hoops too! 7/8 inch long, sterling silver wire with loop at top, designed to hang from hoop earring, slip on and off to change your wardrobe! Features 10mm Swarovski crystal pearl in creamy off-white color, with smaller 4mm color crystal bicone accent and rondelle with AB crystals around it. 3/4 inch long, sterling silver wire with loop at top, designed to hang from hoop earring, slip on and off to change your wardrobe! Features 8mm Swarovski crystal in transparent dark denim blue, with smaller 4mm aurum gold crystal bicone accent and rondelle with AB crystals around it. The touch of gold makes this ideal to hang from your own gold hoops too! 3/4 inch long, sterling silver wire with loop at top, designed to hang from hoop earring, slip on and off to change your wardrobe! Features 8mm Swarovski crystal in color transparent bright sapphire blue, with smaller 4mm crystal bicone accent, silver bead, and rondelle with AB crystals around it. 7/8 inch long, sterling silver wire with loop at top, designed to hang from hoop earring, slip on and off to change your wardrobe! Features 10mm Swarovski crystal pearl in white color, with smaller 4mm aurum gold crystal bicone accent and rondelle with AB crystals around it. The touch of gold makes this ideal to hang from your own gold hoops too! 3/4 inch long, sterling silver wire with loop at top, designed to hang from hoop earring, slip on and off to change your wardrobe! Features 8mm Swarovski crystal in transparent bright sapphire blue, with smaller 4mm aurum gold crystal bicone accent and rondelle with AB crystals around it. The touch of gold makes this ideal to hang from your own gold hoops too! 3/4 inch long, sterling silver wire with loop at top, designed to hang from hoop earring, slip on and off to change your wardrobe! Features 8mm Swarovski crystal in color transparent dark denim blue, with smaller 4mm crystal bicone accent, silver bead, and rondelle with AB crystals around it. 3/4 inch long, sterling silver wire with loop at top, designed to hang from hoop earring, slip on and off to change your wardrobe! Features 8mm Swarovski crystal in color opaque bright Caribbean turquoise, with smaller 4mm crystal bicone accent, silver bead, and rondelle with AB crystals around it. 3/4 inch long, sterling silver wire with loop at top, designed to hang from hoop earring, slip on and off to change your wardrobe! Features 8mm Swarovski crystal in color jet black, with smaller 4mm crystal bicone accent, silver bead, and rondelle with AB crystals around it. Read about what others think of hoop earring charms! Instead of reviews for a specific product, this is a place to share about the designer line in general.